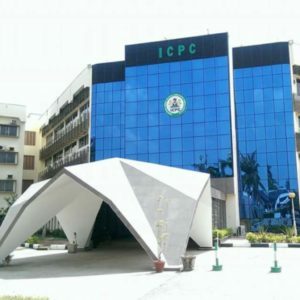 A group known as the “Coalition of New Nigeria (CNN)”, brought a protest to the Headquarters of the Independent Corrupt Practices and Other Related Offences Commission (ICPC) in Abuja ,asking President Muhammadu Buhari for the removal of the APC chairman, Comrade Adams Oshiomhole, for allegedly being a corrupt person, attracting the presence of media personnel in the process. The representative of the CNN, Bar. Stanley Onukwufor who led the group, stated that they were in ICPC to submit petition against Oshiomhole as his offences as APC National Chairman concerned corrupt practices. In her response, the Spokesperson of the Commission, Mrs. Rasheedat Okoduwa mni, who addressed the crowd, stressed that the petition would get the necessary attention it needed. Okoduwa further encouraged the protesters to report any act of corruption and other related offences to ICPC, either in writing or through our mail addresses, assuring that all petitions are given due official attention.